So from time-to-time you may hear me mentioning spoons or refer to myself as a 'spoonie', and no, I am not taking about the spoons in the cutlery drawer! 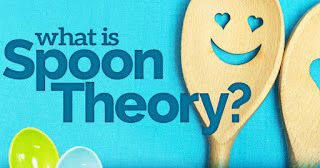 I'm taking about 'Spoon Theory'. So, what is spoon theory? The Spoon Theory is a metaphor as a way of describing what it is like to live with a chronic illness and its limitations. Spoon Theory was created by Christine Miserandino who has Lupus and created Spoon Theory as a way of explaining to her friend what it is like to live with the condition. When you have a chronic illness/disability you have a limited amount of energy - physically, emotionally and cognitively for daily living compared to able-bodied people. With Spoon Theory we measure the energy we have in spoons (and unfortunately we don't have the luxury of having an unlimited amount). Everything takes energy - getting out of bed, making dinner, going to work or school, sorting out your emails, going to a Drs appointment, going out with friends, showering and dressing etc. Each spoon is a unit of energy and we have a set about each and and each task we do takes a spoon away from our daily allowance. So getting up and out of bed = 1 spoon, getting showered and dressed = 4 spoons, breakfast = 1 spoon, work/education = 3 or 4 spoons and so on. Note: the number of spoons it takes for tasks is unique to the individual, for example showing may be a lot easier and cost less spoons for some people and quite difficult for others costing more spoons. For some people, some activities may cost no spoons at all. Some people can reduce the number of spoons it takes to complete a task by using aids or adaptations, such as by using a bath board so they can sit down to shower. However if you are having a bad day, for example,e if I have a seizure, or it's a high fatigue day, tasks take up more spoons, so getting out of bed may take 2 spoons instead of 1 for example. Or you spoon count may be reduced from 12 spoons to 9. We get to a point where we experience a 'spoon crash' as we've used up all of our spoons and have no more left to get us through the rest of the day or we may need a recharge moment by taking a nap or time out. This is when we say that we're 'running low on spoons'. I personally find it's a lot easier and nicer to say "I'm running low on spoons" rather than "I'm running low on physical, cognitive and mental exertion". (Though those who don't know Spoon Theory may give me a quizzical look). I was introduced to Spoon Theory by a friend with MS and for a while I wondered what the heck she was on about when she kept referring to spoons and I even contemplated buying her a pack of teaspoons until one day I asked her "what is it with the spoons?" and then I was introduced to Spoon Theory and have been using it ever since.